One in five green-fingered thieves pilfered pot plants, flowers, hanging baskets and trees from one in five gardens over the last year, research suggested today. Burglars are uprooting horticultural hoards worth £72.21 on average, showing that money does grow on trees after all, insurer More Than said. Some 20% of those surveyed said their gardens have been subject to theft in the last 12 months alone, with researchers suggesting that thieves have been casting their nets wider for items of value in tough economic times. Rare lilies, olive trees, hanging baskets, bay trees and roses were among the plants most frequently swiped. Thieves are often brazenly stealing from people's doorsteps, as seven out of 10 people said the outside space at the front of their home had been targeted at some point. Nearly a third (29%) of the plant theft victims surveyed live in the North East, which was followed closely by the North West, where a quarter of people affected are based. The East Midlands was found to have the lowest levels of this crime, with 13% of people who said they had been victims living in this area. Janet Connor, managing director of More Than, said: "As we've seen from recent incidents of lead being stolen from roofs, thieves are casting their nets ever wider in the search for objects to steal. "And as this research unfortunately shows, garden plants and trees are now firmly on the list. "Cultivating a beautiful garden is by no means a cheap endeavour, with many items, such as bay trees, commanding price tags of £60 or more." Gardening expert and broadcaster Bob Flowerdew said people could take photographs of their gardens to help with identification and making a claim. He said using a marker pen to write your postcode over plant labels would also deter thieves, as well as using large, heavy containers, layers of plastic netting, prickly plants and using a weatherproof bicycle lock to chain hanging baskets up. More than 1,000 homeowners with a garden or outside space took part in the UK-wide study. "Recorded crime in England and Wales falls 4%, with murders down 14% in 2011-12 and violent crime in general down 7%..........."
However, the picture was slightly mixed, with significant rises recorded in the last two years in metal thefts triggered by soaring commodity prices; pickpocketing and thefts of mobile phones and wallets left unattended; and thefts from garages and sheds, including tools and garden furniture. The last category rose by 10% to 1,371,000 incidents last year, suggesting that home security has improved to the point where opportunistic thieves are no longer attempting to break into homes. THE husband of a long-serving local councillor has spoken of his “devastation” after callous thieves stole the memorial bench from a complex named in her honour. Mike Maginnis’s wife, Elizabeth, who represented Granton for 22 years, died aged 54 from a brain haemorrhage in November 2008. Her devotion to the community was recognised last year when new sheltered accommodation in the Forth ward was named the Elizabeth Maginnis Court and a memorial bench was installed there by her family. Mr Maginnis, 61, said the centre at Royston Mains Crescent had become a focal point of commemoration for the family, who would visit and reflect on Elizabeth’s achievements in life. However, the hardwood bench – which cost £1000 and is engraved with poignant messages – was stolen from a secure courtyard at the centre overnight on Saturday. Mr Maginnis said he was “devastated and appalled” at its disappearance but insisted he would not press for prosecution provided the bench was returned. “It’s upsetting for the whole family,” he said. “The bench is a link to the family and recognises the huge amount of work she did in the community over the years she was a councillor. The father-of-three insisted that the theft was carried out by a group of people who must have used a car or van to spirit the bench away. “It beggars belief why anyone would take a bench that can’t be resold,” the widower said. It is understood a section of a 6ft-high perimeter fence showed signs of being bent back where it is thought the thieves had hoisted the bench out of the centre’s garden before fleeing. Mr Maginnis said: “We have involved the police but I am not interested in a prosecution – I only want to get the bench back. “I don’t think we will see it again but I hope somebody in the community might have a conscience and decide they have made a mistake and give it back. “I hope by speaking out we can galvanise the community and shame the people responsible into giving it back. A police spokeswoman said they had been carrying out house-to-house inquiries relating to the theft. Two children’s bicycles were stolen from the back garden of a home. The thieves climbed over a gate into the garden of a home in Watling Street Road, Fulwood, Preston, and unbolted the gate, before stealing two children’s BMX bikes. The theft happened between 11pm on Sunday and 6.30am on Monday. The bicycles had been propped up in the garden. Call police on 101. A bronze sculpture by Henry Moore valued at up to £500,000 was feared headed for the smelter last night after it was stolen from a museum dedicated to the artist. 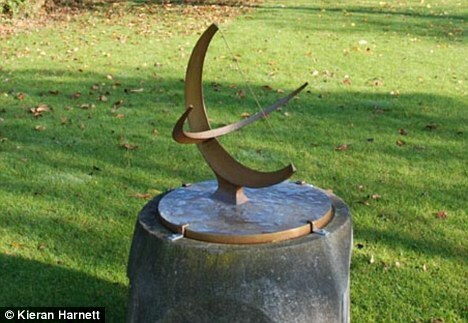 The 22 in-high Sundial, from 1965, was taken from the grounds of The Henry Moore Foundation in Much Hadham, Hertfordshire. The piece may have been stolen to order but police are considering the possibility it will be melted down for scrap and sold for a fraction of its value. A bronze statue worth £3m million was stolen from the same museum in 2005. The two-tonne piece was never recovered and officers later said they believed it had been melted down. It would have only fetched around £5,000 on the open market.